LifeBank — The Business of Saving Lives! We are so thrilled to announce that LifeBank has just closed our Seed Round, led by EchoVC, Growth Capital, and Fola Laoye. It is an important milestone that I believe will go a long way in helping us fulfill our mission of building a big business that solves shortage of medical supplies in developing countries. 2 years ago, we launched LifeBank. At our launch we were clear about 2 things; we wanted to build a company that fuzed technology with logistics and used these two tools to save lives across Africa. We also wanted to show that such a company can be valuable financially. We were completely obsessed with this twin vision. We knew that every year, 26,000 women died because of blood shortage, and that 120,000 little children died because their clinics did not have oxygen, and that was only in Nigeria. It was clear that people were dying en masse in hospitals across Africa, and the developing world, simply because their caregivers could not find the products they needed on time and in the right condition. We thought that was unacceptable. We knew that businesses had a role to play in solving the world’s problems. It was clear to us that through history businesses who were committed to impact solved problems and made money while doing so, at scale. There was a simple mechanism they had that enforced longevity; profits. It allowed them to figure out the most important problems and the ones who could solve it cost effectively, could continue doing so for as long as there are people who needed that problem solved. We wanted to use this same mechanism to hack healthcare supply chain in Africa. We believe the world’s problems will be solved by companies with dual bottom lines. Companies who use the profit motive as a mechanism for good, and who are committed to impact. It is clear that the tides are turning and huge companies like Blackrock, who control over $6 trillion in assets, are joining this movement. We are clearly in good company. The Chief Executive of the company wrote and I quote “To prosper over time, every company must not only deliver financial performance, but also show how it makes a positive contribution to society.” I couldn’t agree more! So two years ago, we set out to prove that we could build a business whose purpose is to save lives. In 24 months, we moved over 9,000 pints of blood to 200 hospitals and saved over 1,000 lives. Whilst this is but a drop in the ocean of possibilities on the African continent, as they say, a journey of a thousand miles starts with 1 important step that Lifebank took two years ago. 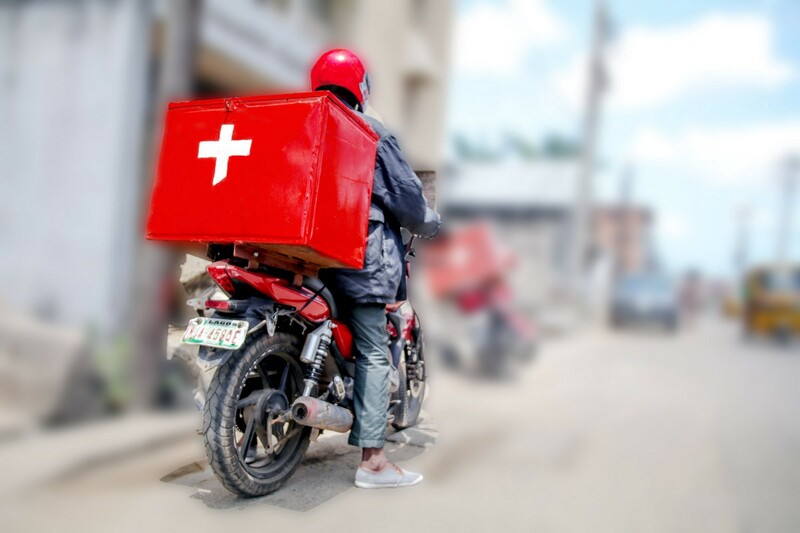 Our goal is to deliver lifesaving medical products to every single village in the developing world. In the next 2 years, we will be launching in Northern Nigeria, where the most lives are lost. We will be testing new technologies, and building a truly formidable fleet of doctors on wheels. We are excited! We have had incredible partners through this journey; the folks at Co-Creation Hub, and my incredible friend, David Oamen. We are also excited to work closely with our 3 new partners, who we believe will help us build a strong institution that will help people on a huge scale. We aim to build a big business that helps hospitals deliver the best health care from Lagos, to Ila Orangun, and to the major cities across Africa and the developing world. We are just getting started. I am lucky to have the best colleagues in the world, who are committed to this same vision. To Ay, Ayodele, Sodiq, Emmanuel, Rachel, Henry, Azeezat, Aisha, Wale, Moses, Joseph and Samuel, thank you for keeping the faith and going on this wild journey with me. I am in awe of your courage and determination.